Debugging is one of the most important aspect of programming. It is crucial to successful software development, but even many experienced programmers find it challenging. With the help of keyboard shortcuts , it can be made faster. So here is the list of all shortcut keys available in visual studio for debugging. F5 If not currently debugging, this runs the startup project or projects and attaches the debugger. If in break mode, this allows execution to continue (i.e., it returns to run mode). It executes all the impacted Test Cases as a programmer modifies the code and makes sure changes do not break Unit Test Cases. 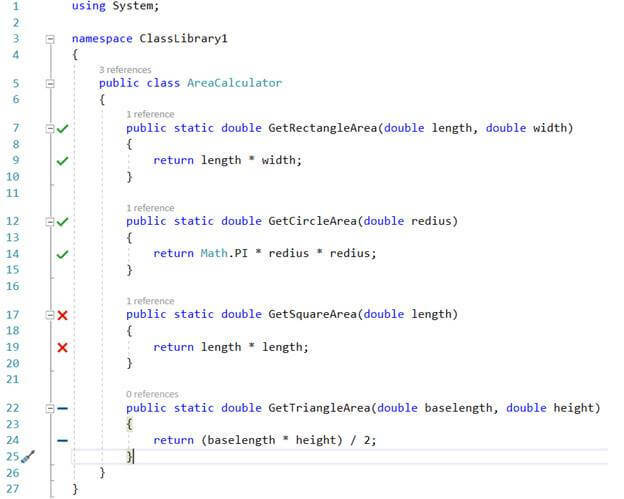 Through the Visual Studio editor, the programmer sees the code coverage in a realistic view. It also indicates which line is covered or not using Live Unit Testing. Live Unit Testing is supported in both .NET Framework and .NET Core. Live Unit Testing is only available in Visual Studio 2017 with the Enterprise edition. We can enable the Live Unit Testing by going to the following menus - Test > Live Unit Testing > Start. After enabling the Live Unit Testing for a project, Live Unit Testing shows options as Start, Pause, Stop and Reset. 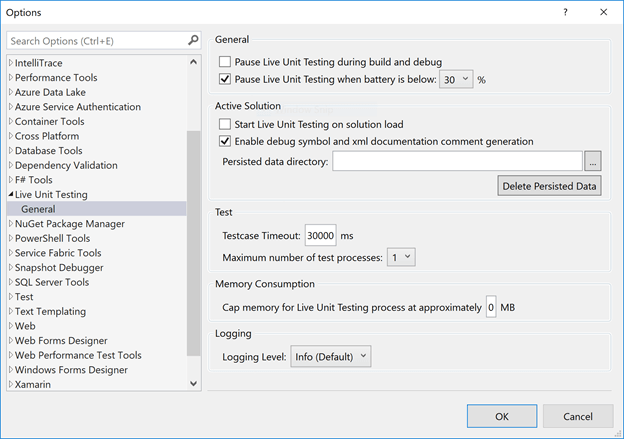 The default configuration can be changed from the Visual Studio Menu Tool > Options > Live Unit Testing > General. We can configure the Live Unit Testing for the Battery and Memory usages, Testcase Timeout, and Logging Level can be set as needed. Open the Visual Studio 2017. Create one Windows Library Project as “ClassLibrary1” and Change the “Class1.cs” to the “AreaCalculator.cs”. Add the Reference of the “ClassLibrary1” project to the “UnitTestProject1”. Add the using statement “using ClassLibrary1;” to the “AreaCalculatorTest.cs” in the using statement section. Open the AreaCalculator.cs and add the code as per the below screenshot. Open the AreaCalculatorTest.cs and paste the below code. I have not added the Test Method for the triangle’s area calculation and incorrectly calculated the Test Method of the square’s area, just to show some behavior of Live Unit Testing. 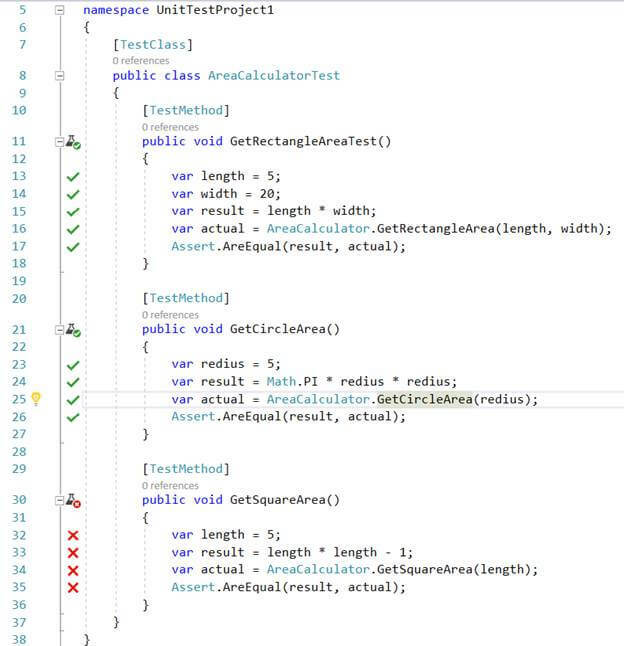 Green Tick Mark represents that this Method is covered for the unit testing. Cross Mark represents that this method is covered for the unit testing, but the test case failed during execution. Blue Negative Mark represent that this method is not covered for the unit testing so a test case needs to be created. What is Load Balancing ? Distributing network traffic across multiple servers effectively is called Load Balancing.To meet high volumes, it generally requires adding more servers. Load Balancer routes the client requests to the servers in an optimized way and takes care that no server is overworked. If a new server is added to the group, It will start sending requests to this new server. periodically pinging server to check its availability. defined algorithms - based on which load-balancer selects the server. The least connection is the default algorithm to select server. Server which has the least number of active transactions is picked by Load Balancer to handle request. Load Balancer maintains records of transactions for each server. Now let's consider the above Least Connection algorithm with different server capacities (CPU/RAM etc.). You would definitely want to allocate more requests to the higher capacity server than the lower capacity servers. Weighted Least Connection is the solution. Let's say there are 2 servers, server 1 and server 2 and server 2 has high configuration.With this algorithm Load balancer will allocate more requests to server 2 to utilize it better. Like Least Connection this also allocates request to the server withthe least number of active connections but the higher configuration server will handle more requests based on the right proportion defined during the Load Balancer setup. Weight proportion is calculated by the server capacity. Server 1 : Capacity X, Server 2 : Capacity : 10X the weight for each server would be 1:10 . There might be the scenario if you don't want to overload any of the servers for some reason, you may use this algorithm to give extra weight to other servers. Round Robin is a vastly used and simple algorithm. Load Balancer distributes requests in the cyclic order irrespective of server inefficiencies. Both the Servers are ready to take request, suppose request comes and load-balancer routes to Server 1 then if a second request comes it will be routed to Server 2. The third and fourth will be routed to Server 1 and 2 respectively in a cyclic order. Even if one of the server has stronger configuration i.e. RAM, CPU etc. As per Round Robin algorithm Load-Balancer will follow the cyclic order. Like Round Robin this is also cyclic but the higher configuration server will handle more requests.Rest it is same as Weighted Least connection algorithm i.e. weight would be defined during Load Balancer setup and high weight server will handle more requests. i.e. if weight proportion to server 1 and server to is 1:10. first 10 requests will go to server and 11th request will go to server 1 and next 10 request will go to server 2 and so on. This algorithm generates a hash key using client and server IP addresses which means this key would be assigned to client for subsequent requests which assure that the client is routed to the same server that it was using earlier.This algorithm can be used to achieve Session Persistence or Sticky Session. In the multiple server environment a user might experience losing cart items during navigation. Persistence session or sticky session is the culprit. As you know Http is a stateless protocol which means in subsequent requests it doesn't maintain any information about the user so to identify server uses client's ip or cookie to track users session. Sticky session is to make sure all the requests goes to the same server which has its user's session tracking information. In Layer 4 Load Balancing , Load balancer decides the server on which it will redirect the requests on the basis of the IP addresses of the origin and destination servers (Network Layer : Layer 3) and the TCP port number of the applications (Transport Layer : Layer 4). On the other hand Layer 7 Load Balancing decides routing on the basis of OSI Layers 5, 6, and 7 which together makes Http. To get an overview of OSI Model, please read my post . The BackgroundWorker allows you to execute operations that take a long period of time such as database transaction or file downloads, asynchronously on a separate thread and allow the user interface to remain responsive. To start the operation in the background you have to call the RunWorkerAsync() method of the BackgroundWorker, when you call this method the BackgroundWroker starts the execution of the background operation by raising the DoWork event, the code in the DoWork event handler is executed on a separate thread. You can send a parameter to the background operation using the RunWorkerAsync() method. You can receive this parameter by using the Argument property of the instance of DoWorkEventArgs in the DoWork event handler then you cast it to use it in the background operation. By using the BackgroundWorker you have the ability to report progress updates of the executing operation. To use this options you must set the WorkerReportsProgress to true. To start report progress you call ReportProgress() method and use it to pass a parameter that have the value of the percentage of the progress that have been completed. This method raises the BackgroundWorker.ProgressChanged event. In the event handler of the ProgressChanged you can recieve the value of the progress precentage on the main thread using the ProgressPercentage property of the instance of ProgressChangedEventArgs. With the BackgroundWorker you have the ability to cancel the background operation, to do this you first must set WorkerSupportsCancellation property to true. The next step is to call the CancelAsync() method by doing so you set the CancellationPending property to true, by polling the CancellationPending property you can determine whether or not to cancel the background operation. When the background operation completes, whether because the background operation is completed or canceled, the RunWorkerCompleted event is raised. You can alert the user to the completion by handling the RunWorkerCompleted event. You can determine if the user canceled the operation by using the Cancelled property of the instance RunWorkerCompletedEventArgs. You can return a value from the background operation that in the DoWork event handler using the Result property of the DoWorkEventArgs instance, and you can receive it in the RunWorkerCompleted event handler using the Result property of the RunWorkerCompletedEventArgs instance. Node.js Hosting Europe - HostForLIFE.eu :: How to Use Inheritance in Node.js ? You'll use Object.create() to inherit one object to a different in Node.js also. In this post we'll learn to use util module to achieve inheritance in Node.js. First, you should to import util module in your application. Next we tend to we progressing to make ArtsStudent object which is able to inherit Student object. On this example ScienceStudent object inherits both Student and ArtsStudent objects. With this example, you can work with inheritance in Node.js using util module. I hope it works for you! Windows Server 2016 SSD Hosting - HostForLIFE.eu :: PowerShell Script To Reading SQL Data, Creating CSV File And Push To SFTP/FTP Path? The below powershell cmdlets are used to create csv files by querying the SQL server. $SqlQuery = "SELECT * from tableName;"
$SqlConnection.ConnectionString = "Server = $SQLServer; Database = $SQLDBName; Integrated Security = True;"
When Intergrated Security ="true" is used, the cmdlets use current logged in user credentials - network credentails if Integrated Security ="false" we need to use the declared $uid and $pwd while establishing the connection. The Powershell variable mentioned in the below code snippnet stores all the details of the SFTP or FTP server, where the files need to be moved. We need to disconnect the session that was created to do this operation. Once it has run, the file that is present in sharepath is moved to the SFTP server location. Recently, Microsoft has announced the availability of Preview of Visual Studio IntelliCode in its Build 2018 developer’s conference. This is a new experimental tool for Visual Studio users bringing more of the company’s artificial intelligence smart to software development. It is a set of AI-assisted capabilities which improves the developer’s productivity with features like contextual, IntelliSense and focused reviews for pull requests. According to the company, IntelliCode is now applicable only for C# code but in future, it will be upgraded to support more languages. Windows Server 2016 SSD Hosting - HostForLIFE.eu :: How To Securely Delete Files From Your Servers? Do you know what happens when you delete a file in a GUI or run rm file.txt on the command line? If you said the file is deleted, you are only half right. In fact, the data stays just where it was before you “deleted” it. You can’t see it because the link the operating system used to identify the file and show it to you no longer exists. But the data is untouched until the operating system uses the space for a different file. It’s easy to restore data that has not been securely deleted. That’s bad news if the hard drive the data is on is sold, leased to someone else, or thrown in the trash. There are business, security, and legal consequences if server data is not securely deleted. The only way to securely delete data is to overwrite it. You could also destroy the drive, but businesses typically lease servers that they don’t have physical access to or they own. They need to be able to securely delete data remotely. A quick rm doesn’t cut it. Before I outline the best way to securely delete a file or volume, a word of warning. If you do this, the data will be gone forever — that’s the point. Before running any of these commands, make sure you really mean it. As I have already said, rm removes directory entries. It does not delete data. To securely delete the data, you must use a tool that both removes the link and overwrites the data. One such tool is shred, which will repeatedly overwrite the file’s data with random bytes. Shred overwrites the file three times with random data, although you can specify how many times the data is overwritten with the -n option. If you don’t use the -u option, shred will overwrite the data but it won’t remove the file. The shred utility can securely erase drives, but we’ll explore an alternative. Before running these commands, check that you have correctly identified the drive you want to erase. The command will run on the boot and root drives without warning. Linux represents drives as files. For example, the file /dev/sda1 represents the “first” drive on your server. The dev directory is not a normal directory, but a collection of special files representing devices connected to the server. Identify the drive that you intend to erase all data from and take note of the special filename. We’re going to use dd to overwrite the data on this drive with either random data or zeroes. The dd command “converts and copies a file”. In this case, we’re going to take data from a special file and overwrite our target drive with it. Linux provides several special files that generate a stream of data, including /dev/zero and /dev/urandom, which contain lots of zeros and pseudorandom data respectively. Here, we designate /dev/random as the input file and direct its data to overwrite the drive. This will destroy all data on the drive. On modern high-density drives, multiple passes are usually not necessary, but it doesn’t hurt. There are some limitations to this approach that you should be aware of. If the data is being backed up to a different drive, it may remain accessible. If the drive uses a modern journaling filesystem like ext4, some data may not be erased properly. SSD wear leveling can also interfere with secure deletion. For sensitive data, it may be best to use an encrypted volume rather than relying on secure deletion. The data from an encrypted volume cannot be recovered without the key even if it has not been securely deleted. A couple of months ago, I started using Visual Studio Code for my development activities. I found myself very uncomfortable with the keys and shortcuts. I have been using Visual Studio for more than 6 years now. So, I was very comfortable with the keys and shortcuts of that. The difference in shortcuts was creating a challenge for me. Should I remember a different set of shortcuts for VS Code? Should I start using some other editor? Open keyboard shortcuts in Visual Studio Code and update the shortcuts as per your need. Press ctrl+K, ctrl+s to open the keyboard shortcut window. This looks something like below. You can see the Edit button on the right side of the row (highlighted one). On click of the Edit button, it will ask you to change the combination you want to execute the command for. You can change the combination for your convenience. You can open keybindings.json file and update as per your need. 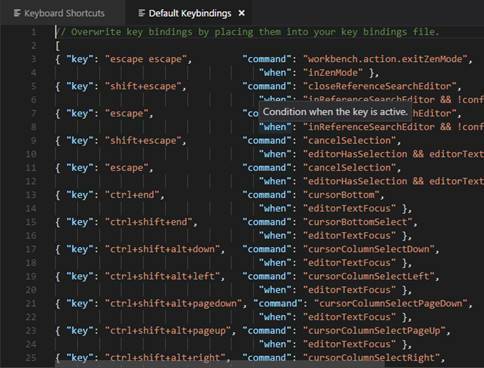 To open the keybindings.json, you need to open the Keyboard shortcuts first by pressing ctrl+k, ctrl+s. You can click on the keybindings.json file. This will open the default keybindings. This is a JSON file which can be modified to get your desired shortcuts. You can have your custom JSON file with your shortcut commands. When you open default keybindings.json file in the right-hand side window, it opens a keybindings.json file where you can write your custom keys and commands. Given are a couple of commands I have added in the keybindings.json file to work with the VS Code. Please let me know your feedbacks/ comments. Are there better ways I am not just aware of? Before starting the code you need an account in send grid which will send the notification to your mail. Generally we use email notifications for forget passwords in your applications. You can follow the below steps to get the task done and if you have any queries please leave a comment below. We require a few modules from npm to send the notification through the mail. In my case I am using waterfall methologie for this method with will execute acyn in method, In the above code initially I am updating the collection with resetPasswordToken and resetPasswordExpires using email id and getting my send grid credentials from db form Accountsettings collections. If you can observe in mailOptions text "req.headers.host" will be the link which will get in you mail with token. When you click on Url which you got in the email it will redirect you to another page to set the password. Hope this code will help someone who really needs it. Thank you.